Fujitsu Laboratories Ltd. and the Fraunhofer Heinrich Hertz Institute HHI today announced the development of a new method to simultaneously convert the wavelengths of wavelength-division-multiplexed signals necessary for optical communication relay nodes in future wavelength-division-multiplexed optical networks, and have successfully tested the method using high-bandwidth signal transmission in the range of 1 Tbps. In the conventional optical wavelength conversion method each individual optical wavelength is converted into an electrical signal and re-transmitted at a new wavelength, which is impractical for terabit-class processing as each wavelength requires its own O/E/O circuit. Using the new technology, the optical wavelength conversion and the polarization state are controlled at the same time, so simultaneous wavelength conversion of wide-band optical signals can be achieved without restrictions on the wavelengths of the optical input signal or the modulation formats. As a result, processing can be achieved with a single wavelength converter, regardless of the number of wavelengths multiplexed. Therefore, considering optical signals in excess of 1 Tbps multiplexed from ten wavelengths, for example, the new method can process them using just one-tenth of the power or less compared to previous technologies that required a separate circuit to convert each wavelength into an electrical signal and back. By applying this technology to the optical nodes within the optical network, the usage efficiency of the communications band is improved, and this is expected to contribute to a more stable communications environment. Details of this technology will be announced at ECOC 2016 (42nd European Conference on Optical Communication), an international conference that will be held from Sunday, September 18 to Thursday, September 22 in Dusseldorf, Germany. Today, optical fiber networks which support large-scale datacenters and sophisticated cloud-based ICT services rely on wavelength-division-multiplexing (WDM) technology, which combines optical signals of different wavelengths for transmission in a single optical fiber to connect multiple terminals in an optical network with high bandwidth and low latency. In recent years, the bandwidth achieved per wavelength typically is 100 Gbps with the polarization-multiplexed quadrature phase shift keying modulation method(1) . Progress is now being made on developing technology that, by increasing the modulation multiplicity, will make it possible to achieve terabit-class high-bandwidth communications environments in the future. When connecting multiple terminals in an optical network, it is necessary to avoid collisions/contention (figure 1) by having the ability to convert between wavelengths because optical signals of the same wavelength cannot be transmitted in the same optical fiber between the optical relay nodes. Previously, two methods were proposed: A method for momentary conversion into an electrical signal (left side of figure 2), and a method using nonlinear optical effects and a wavelength filter (right side of figure 2). With the first method, however, there was an issue due to the increase in processing latency from the mutual conversion of electrical and optical signals. Another issue was that because one conversion circuit is required for each wavelength, an increase in the number of multiplexed wavelengths increases the amount of consumed electricity. Likewise, with the latter method, although it enables wavelengths to be converted in one batch, the practical implementation is problematic because it requires a filter element to remove just the wavelengths of the signal prior to conversion, making it difficult to handle signals with a variety of wavelengths. 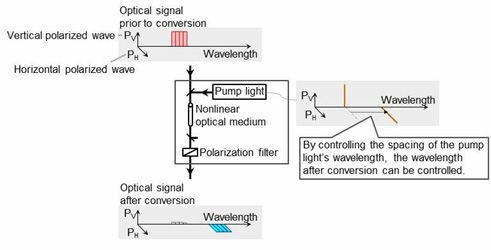 Now Fujitsu Laboratories and Fraunhofer HHI have discovered a new simultaneous wavelength conversion method that controls the optical wavelength conversion and the polarization state at once, and have created a prototype wavelength conversion circuit based on this principle. Using this prototype circuit, they succeeded in an experiment to simultaneously convert optical polarization division multiplexed optical signals exceeding 1 Tbps. This represents the world's first successful implementation of a simultaneous wavelength conversion capability that functions without any restrictions on the wavelength of the optical signals input or the modulation format. 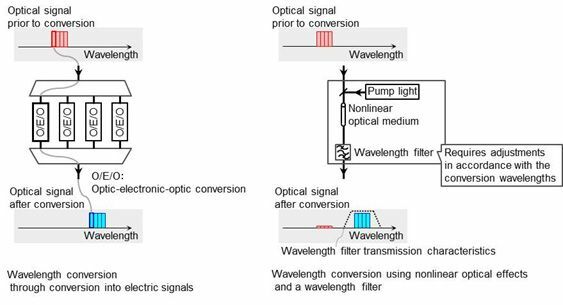 It is known that by combining an optical signal comprised of multiple wavelengths with pump light when inputting into a nonlinear optical medium, it is possible to generate a wavelength converted light that is still mixed with the input optical signal. Fujitsu Laboratories and Fraunhofer HHI developed a new simultaneous wavelength conversion technology that, in accordance with the wavelength conversion, alters the polarization state of the optical signal, and, using a polarization filter instead of the wavelength filter used in previous technologies, removes the optical signal prior to the wavelength conversion. It then extracts just the optical signal after the wavelength conversion. By controlling the spacing of the pump light's wavelength, the wavelength after conversion can be controlled at the user's discretion. The two components of the optical signal consist of the vertically polarized wave and the horizontally polarized wave. By separating them, performing the wavelength conversion in parallel, and then recombining the signal, Fujitsu Laboratories and Fraunhofer HHI developed a technology for polarization-multiplexed signals. Using a prototype circuit based on this principle, they achieved simultaneous conversion of polarization-multiplexed signals exceeding 1 Tbps. Whereas, previously, for the wavelength conversion of high-bandwidth optical signal of 1 Tbps, for example, 10 converters were required for conversion into electrical signals, simultaneous conversion using just one converter is possible using the new technology. This enables to achieve the equivalent function while consuming one-tenth the power or less than previously required. In addition, because there are no restrictions on the wavelengths before or after conversion, this technology will contribute to the creation of next-generation optical networks in which the configuration of the network can be flexibly modified. Targeting practical implementation around 2020, Fujitsu Laboratories and Fraunhofer HHI will work on further improvements in conversion efficiency as well as improvements in the feasibility of volume production that are needed for commercialization of this technology. An optical modulation method that has become the de facto industry standard for 100 Gbps optical transmission systems. It combines quadrature phase modulation with polarization-multiplexing technology, in which the vertically polarized wave and the horizontally polarized wave of the optical signal are multiplexed to double the transmission capacity. Innovations for the digital society of the future are the focus of research and development work at the Fraunhofer Heinrich Hertz Institute HHI. In this area, Fraunhofer HHI is a world leader in the development for mobile and optical communication networks and systems as well as processing and coding of video signals. Together with international partners from research and industry, Fraunhofer HHI works in the whole spectrum of digital infrastructure – from fundamental research to the development of prototypes and solutions.